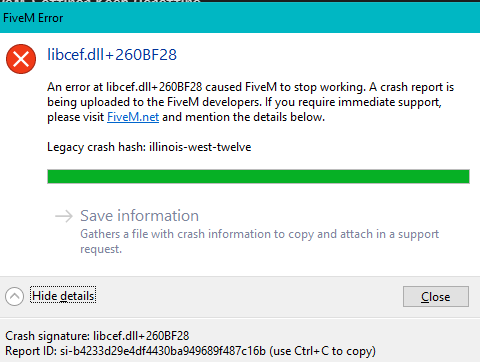 An error at libcef.dll+260BF28 caused FiveM to stop working. A crash report is being uploaded to the FiveM developers. If you require immediate support, please visit FiveM.net and mention the details below. I have the exact same crash. Debugged the dump file which sadly didn’t contain much of a callstack, but it looks to be an access violation (0xC0000005), which is unfortunate, as it could indicate any number of issues. I have the same problem, and moreover it’s happening more frequently to me no matter what I’ve tried.